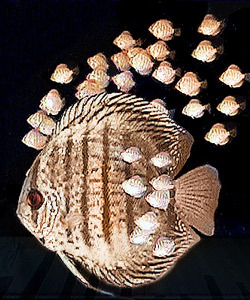 Getting started can be quite intimidating if you believe all the “negative press” that discus fish receive. But the truth is that you can be very successful if you just follow a few simple guidelines. Make certain you are feeding your discus properly. They are big eaters. The first thing you should know is that Discus fish obey a social pecking order, and the more fish in a tank the better off you are, because the pecking will be distributed over more fish and there is less likely to be on fish bearing the brunt of being the whipping boy. You will also need a larger tank, because Discus will need room to roam, I like the ninety to one hundred and fifty gallon range. Another good thing to know is that Discus like their water refreshed every week, about twenty five percent or so will do every week. For whatever reason, they crave a water change and I have been told you cannot give them too much fresh water. Another handy tip to keep in mind is not to put any other fish in the tank, save a good Pleco or a small school of tetras. Discus do not share tanks well and many fish will rip apart these gentle animals. Get your stock from a good reputable breeder, the pet store is usually a bad idea as they are not going to be able to guarantee such an expensive animal and you have no clue how healthy or otherwise the fish are. Start with a good school of about ten or fifteen, and build up should you have room. You may lose some, but there will be enough to keep them all happy together, they love a crowd, especially the young ones. They like their water warm and look into their current PH needs. Many people believe you must be a master aquarist to own Discus, but that is simply not the case today. Modern hybrids are far hardier than the counterparts of yesteryear, and more is known about them today than ever before, giving a wealth of knowledge to our community. Do some digging and see what you can learn, you may have the setup to get an amazing tank going and not even know it.